Prestige Ozone as the name suggests homes luxurious villas with with up to date facilities and amenities to rival many hotels around. The houses are posh and safety within the well maintained compound makes this place a little dream for me. It houses many of the expat community and the wealthier Indian population. Now within Prestige Ozone a newly opened restaurant called Salt Mango Tree. Richard and Kenneth have been boasting about this restaurant from the moment I stepped into the car at the airport. Richard’s curry flavors are quite questionable at times and Kenneth, well he likes it, he eats it, no comments from him. So Sunday night before they left for the Netherlands they decided to have dinner over there, and since I opened my big mouth and said I had not had any Beriani Rice yet, even during my last trip, so they said I had to try it. Upon entering Salt Mango Tree, well it says nothing that it is an Indian Restaurant featuring Kerala food, because I did see Italian food on the board along with Indonesian food as well. So I thought, ok…. here goes one of those places that cannot have signature food but needs to cater for the different ethnic groups in the Prestige Ozone enclave. Can’t be that good I thought.. since you cannot present your Signature food to the masses. Ambience wise, sparse, and nothing that shouts anything Kerala. Truth be told, yours truly is also not well versed with Kerala ambience so this is all big talk, but frankly there was nothing Indian for that matter besides the very friendly, polite and professional waiters. So the menu was handed to me. Me who has no idea of Kerala food gazed at the menu and frankly speaking knew nothing. There were a few Kerala words I noticed as I have heard the Tamil word before, so I guessed my way through the menu with Richard recommending everything in the end. I must say, the variety of Kerala foods was baffling for me because coming from a country where we have a lot of Indian food, I think only five or six foods on that menu made its way to Malaysia. It made me realise how shocking my knowledge of Indian food was, and this is something I have to look into this year. I need to learn about Indian food – South Indian in particular. So we ordered Appetisers. I chose Fish Chukka and Vazhappoo Cutlet. Both I have never heard off in my life. As usual, we set them off to prepare the Appetisers first and then proceeded to order our drinks. This according to Richard would synchronize the whole meal. So for beverage I ordered The Green Machine, Kenneth ordered the Vanilla Milkshake and Richard ordered a very pretty drink, which for the life of me I cannot remember the name. Yes, I have my moments. For main course, we ordered Choru Mutton Curry which was the special of the day but actually a starter, so there was a bit of confused looks when we tried to explain that it was fine to serve us a starter as a main. We ordered the Thalssery Chicken Beriani which was also a special and Kariveppila Kozhi Curry with Parotta. Of all the above, I knew the Kozhi curry had curry leaves! 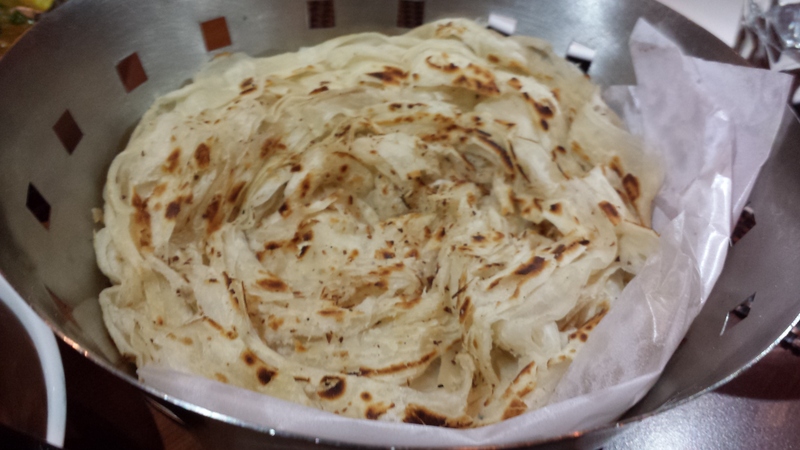 Parotta is similar to Roti Canai but truly lacks the oiliness that we are used to in Malaysia. So the appetisers appeared. Fish Chukka. Having no idea what it was as the description was quite vague. So from apperance, it looked wonderful to me. Boneless fish cubes which I believe to be Mackeral cooked perfectly that it was not dry and flaky or undercooked and falling apart. It was perfectly flavored with the spices and I saw some cariander seeds and thickly grated coconut which added that extra bite to the fish. I must look up this recipe and try it out, or at least learn about Kerala cuisine. I am sure the coconut is manually scraped with the myriad coconut scrappers they seem to have in the shops and supermarkets over here. Fish Chukka can be eaten with rice or on its own. I think, this will be nice as a wrap, get a tortilla skin,, add some vegetables and stuff it with Fish Chukka. I am sure it would be good. Then the Vazhappoo Cutlet came. Again I had no idea what it was although |I knew it was a cutlet of some sort which I also make but this one had banana flower. This was something I was looking forward to. I have only eaten banana flower cooked Malay or Indonesian style floating in coconut milk, and it was not my favorite at all. This was served with Beetroot chutney.. It was a frightening looking sauce that looked more chilly hot then anything. 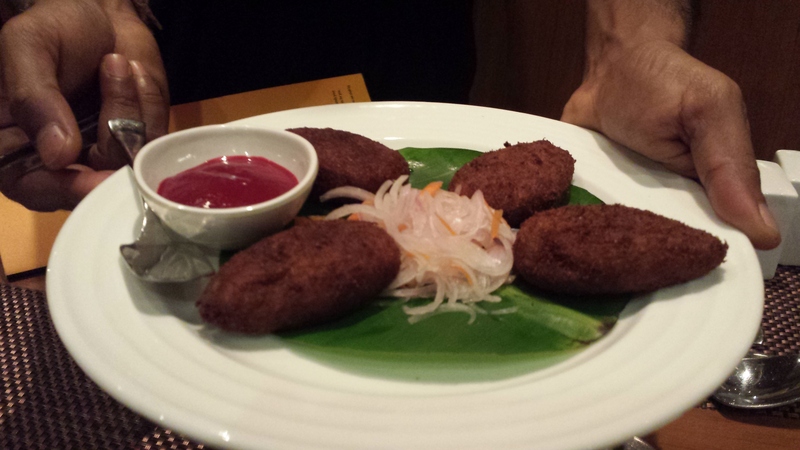 I swear I never knew beetroot was part of the Indian diet till I came to Bangalore the second time. I asked the waiter how this came to be but got a muffled up answer so as I am typing this I am looking for information. Just found out that India is the second largest beetroot provider in the world, but mostly it is all consumed by the country itself. Nothing more can be found at the moment. So it is no wonder it is used in many dishes all over the country. So here is my view of the Vazhappoo Cutlet. It had a nice texture and its main ingredient was potato. However, I feel, the banana flower should have been more visible and at least give me something to bite that I can distinctly know it is banana flower. There is nothing wrong with it because it is probably how it is made, but I would prefer to taste some banana flower or at least bite some. The cutlets did go well with the beetroot sauce or chutney. The spiciness of the beetroot along with the sweetness of it did give the Vazhappoo Cutlet some layers of different flavors. It did go well with the onion and carrot pickle. Then as Richard had mentioned about synchronizing the meal order, the drinks came. I only seem to be able to find Richards and my drink for some reason. Richard’s drink which for the life of me I cannot seem to remember was truly a nice calming drink. 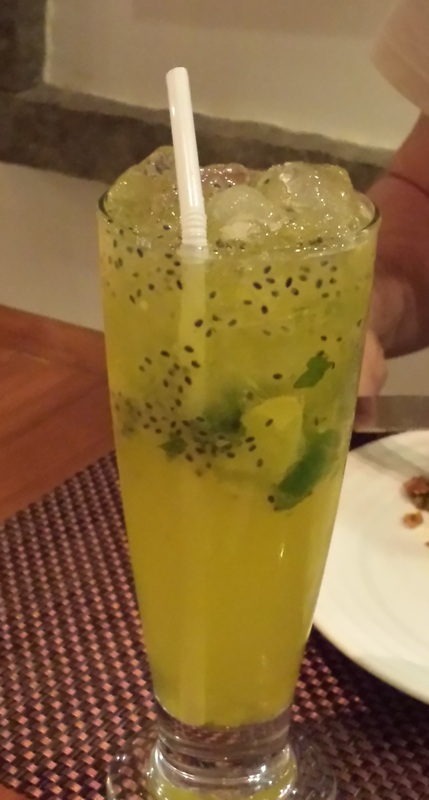 It had Basil seeds (biji selasih in Malay or Tulsi Seeds in Tamil) that dotted the drink. 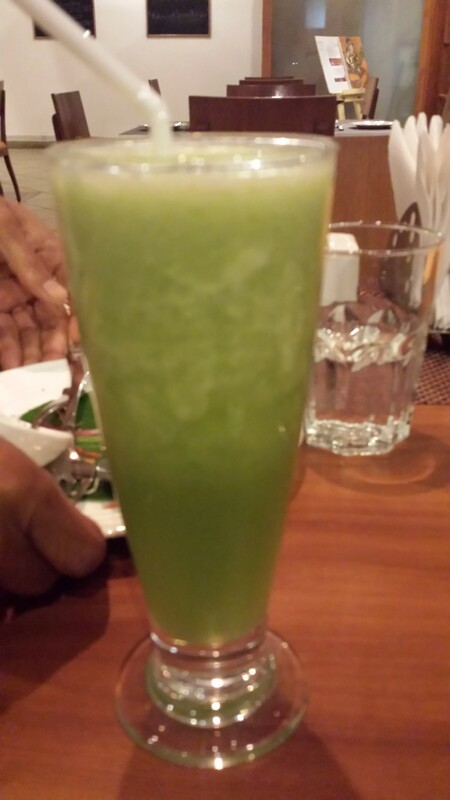 It might be the Nellika Magic which had Coreander leaves and lime with a pinch of salt with soda water. Refreshing and had a nice tang and the little basil seeds gave it that bite. It even had bits of green chilly. I love basil seeds. When I was a kid I would freak out everyone telling them it was frog eggs. My Green Machine was somehow less photogenic as it consisted of Coriander, Mint, Coreander, Lemon and salt all juiced together so then end result was GREEN. Maybe some little garnish might have given it some uplifting or perhaps. It would have been a wonderful drink for breakfast, a nice pickerupper but somehow it didn’t complement my meal. This is my fault for choosing the drink. Then our main courses appeared. 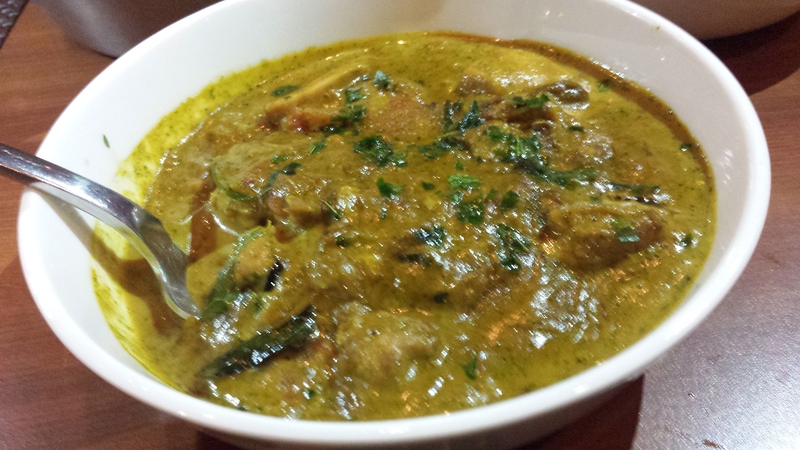 Our Karivepilla Kozhi Curry which was a chicken cooked in spices with curry leaves was utterly mouth watering. I love curry leaves so I don’t mind eating them. This curry went perfectly with the Parotta’s and Rice. The blend of spices was just perfect to me. I think it could have been spicier but perhaps because Richard was around, so Salt Mango Tree held back the chillies. The boneless chicken had taken in all the flavors and was still succulent. I do not eat Indian food very often unless it is the simple dosa and idly’s so these were actually all a first time for me except for the Beriani. Let’s just say that it was truly a virginal affair. The Thalassery Chicken Beriani was quite an eye piece to me any how. 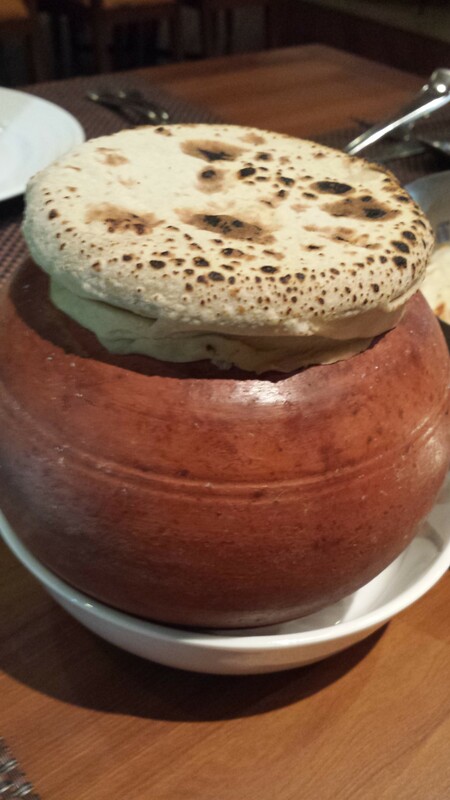 All dhummed up with Chappati dough in a eartherned vessel was just special to me. The chappati dough is used to cover the pot so that the steam will cook the rice and the frangrance will not escape. And it sure didn;t escape this one. Then he opened it and out came the steam from the cooked rice with chicken. Unlike the Beriani Rice we usually eat in Malaysia which is very highly spiced and very deep in color either from turmeric of spice powder, Kerala style is usually not so flavorsome and deep in color but still good. One would say it is tenderly spiced and lightly colored to make it look like it is very light in flavor. 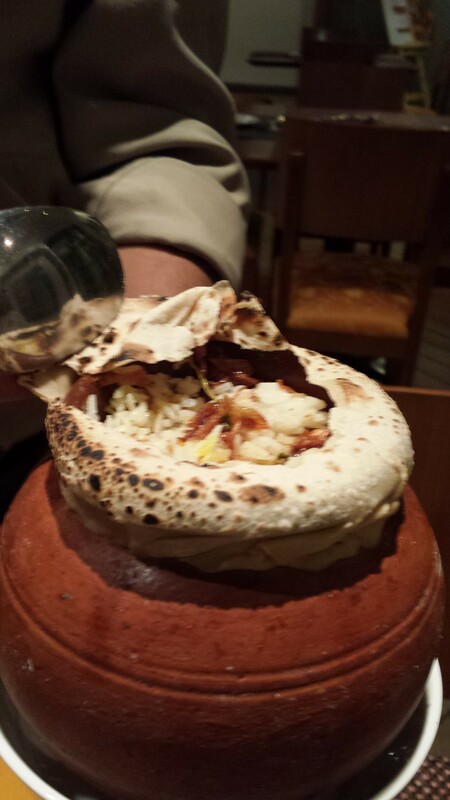 The waiter served us carefully and the fragrance of the rice when it hit the plate was truly wonderful. It didn’t reek of spiciness but was just tenderly flavored enough. Next was the Choru Mutton. 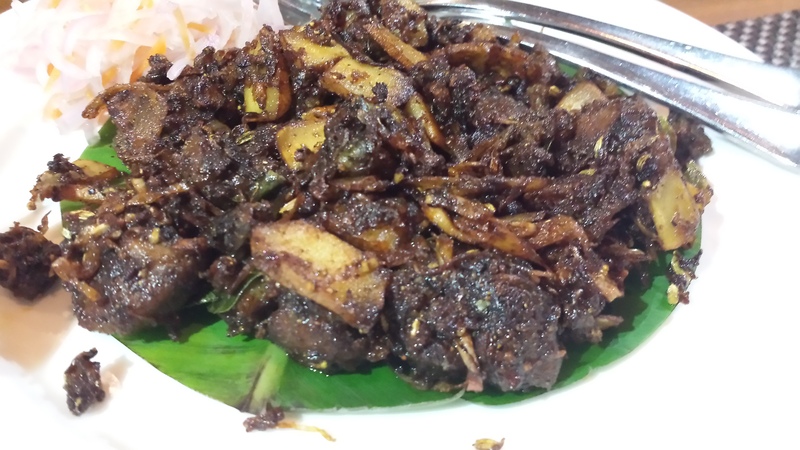 This at first glance resembled Mutton Varuvel which is also South Indian and usually served in Indian shops in Malaysia. The curry is cooked dry and often it goes well with beer. This Choru Mutton however, was different. It was a lighter version of the Varuvel. It didn’t have the chilly hotness yet it was heavily spiced, but unlike what I usually cook comes with heaps of curry leaves, potatoes and dried chillies and lots of spices. This one had a lot of class. Although this is South Indian, and so is Mutton Varuvel, I wonder how South is my version, because at this moment I feel it is at the bottom of the list. Quite shocking isn’t it! 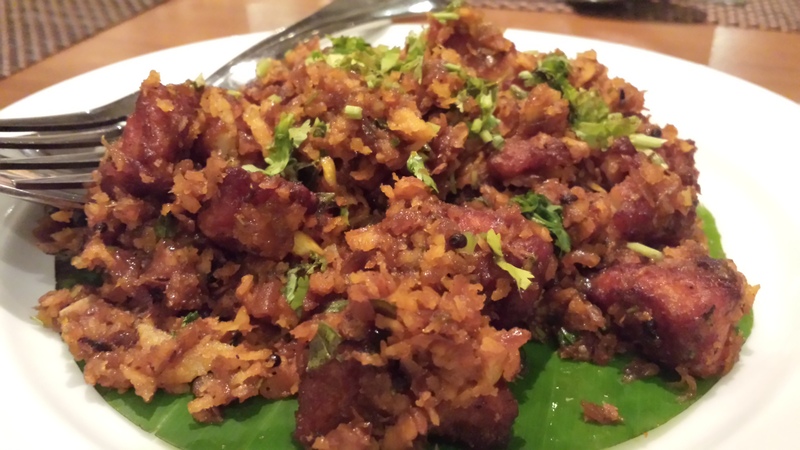 The Choru Mutton was tender yet dry but the dryness went well and the secret weapon here was the coconut shreds. I have never ever seen that used before. Either due to lack of knowledge or just plain ignorance I have never ever seen this kind of coconut used before. The dry fried coconut gave the dish so much more texture and flavor and a nice crunch. It was not as dry as well, it had just the right amount of juiciness. Meanwhile, the Parottas were just perfect. It was fluffy and not oily but also not dry. Even when it was cold it was still nice and remained fluffy. Our Malaysian Roti Canai tends to get doughy and hard. I had a good time at Secret Mango Tree. It was an eye opener for me because now I know I lack so much knowledge of South Indian food. So lacking that it is embarassing for me to say I can cook Indian food.! I am thinking of packing some Choru Mutton to take it back home. So since the year is still young, I am committing myself to my first Resolution for the year. Learn and promote new South Indian Style food!